A Geographic Information System (GIS) integrates hardware, software, and data for capturing, managing, analyzing, and displaying all forms of geographically referenced information. A GIS is often thought of simply as a mapping tool, however, a GIS also provides very powerful data analysis tools that support and improve decision-making and problem solving. SOCPA's GIS division is responsible for building and maintaining the County's GIS. We create, acquire, and maintain a wide array of spatial data sets, maps, and applications that support government functions. The GIS has become an essential tool that is used by most County departments to maximize effectiveness and efficiency and improve decision-making. 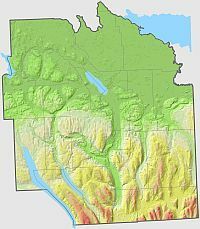 You can access County geographic information and create your own maps online using our Syracuse - Onondaga County GIS on the Web application. Or, you can view and download commonly requested maps by visiting our Map Gallery.